Adorable pair of sought after shelf sitters made by Ceramic Arts Studios. 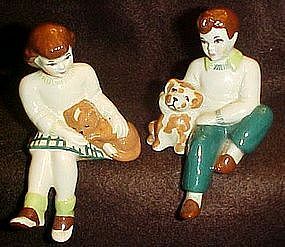 This is the sitting boy with dog or puppy, and his matching sitting girl with kitty cat. I originally thought they were perfect but upon very close inspection I notice around the girls turtleneck is a flaw or repair. It is hard to tell which. Price reflects this discounted flaw. They are otherwise just perfect! !4 1/2" tall. Sold as a pair.